Any marketing campaign without a landing page is an incomplete attempt. Landing page provides laser focused content to the users and psychological triggers will help you get more leads. 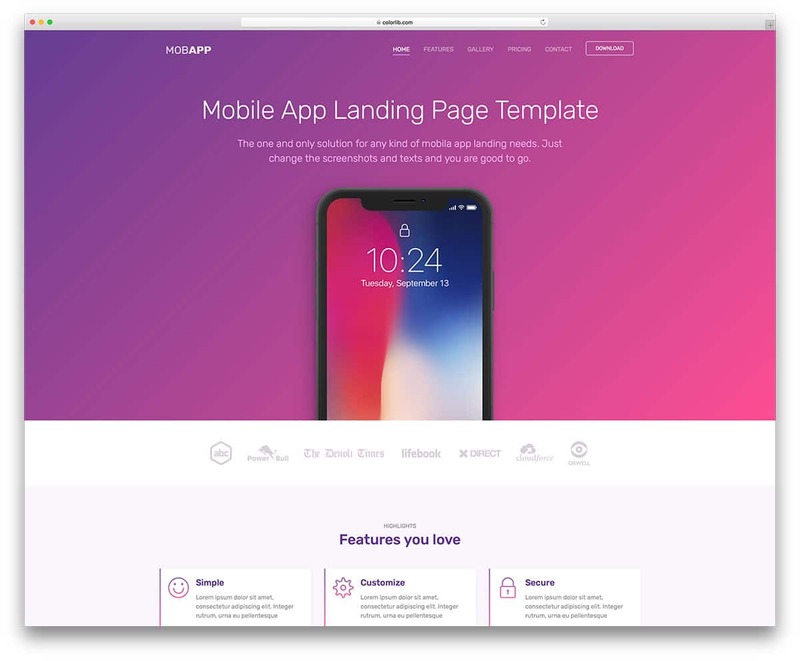 These free landing page templates will help you to create an effective landing page in no time. The content should be related to the campaign through which the user came in. There must be a hero element that should project your product features. One common design trick that works on all landing page is the bulletins. Yes, they may be a minor but they greatly help you to focus on the important content. Even am using a bulletin now, so you know how it works. 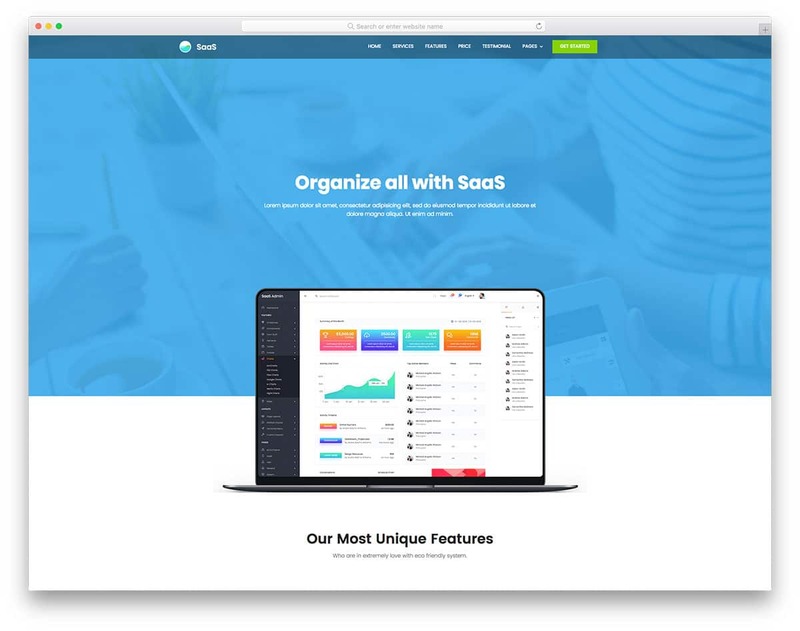 We manage to collect some of the best free landing page templates that almost follows the basic traits of an effective landing page and the landing page anatomy shared by the conversion experts of Unbounce. Without further delay let us get into the free landing page templates list. 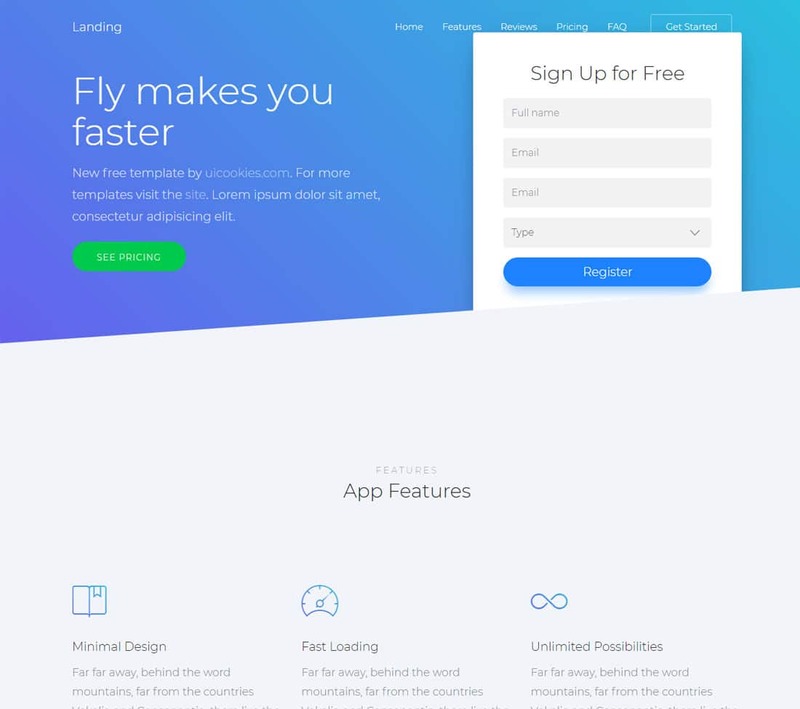 Landing is a modern app landing page template. To help you get more leads the registration form is placed in the header section. As soon as the users land on your page the first thing they note is a warm intro about your product and a call to action button. This is a one-page template so the user can see the entire details about the product by just scrolling. The Landing is a clean and simple landing page template without any animation effects. The visual effects are added only to the required web elements, so the user can enjoy your product without any distractions. Since it is a one-page template the navigation bar is made sticky at the top, so the user can easily jump between the sections easily. In the top bar also a call to action button is given for the signup. If the people wish to join the list after completely seeing your product features, this top bar button will help them join instantly at that very spot. Gaas is a trendy looking landing page template with full of beautiful vectors and art images. Since this template is primarily designed for app landing pages, you et plenty of elements related to it. But still, you can use this landing page template for other purposes as well. In the header section, you have a big title space and few lines of texts to give a crisp into of your product or your campaign. Bulletins always help us convey the important points properly, in this template also you get listings, but in a more appealing way. Tabs are used to help you more share more contents without consuming more space. Gradient color schemes are used carefully throughout the template so that they don’t look messy. Almost all type of elements like carousels, pricing tables, rating elements and lot more are given in this template. So you can set up a landing page in no time using this template. 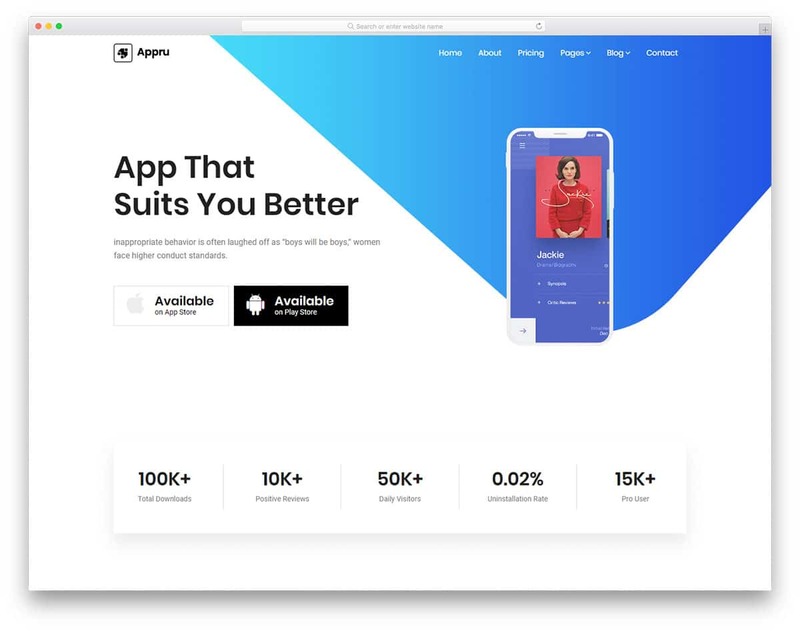 Appru is another application landing page. The designer of this template has followed a block style design with sharp edge square box elements. Plenty of space is reserved for the images and the video contents. Sometimes the landing page should be short and sweet, in those case images helps you to clearly explain your service or product. If you are planning to make such a landing page, the Appru landing page template is worth a try. A mini website layout is followed in this template, with navigation options at the top. By making few customizations, you can even use this template for a business website. Visual effects are used smartly to highlight the important web elements. Another useful feature with this template is it has pre-designed blog pages for you. Standout is a bold looking landing page template. The big bold texts easily highlight the important content. Dark and light colors are used in this template to get the user attention on the required web elements and the contents. All the web elements and the sections are made big enough so that the user can interact with this landing page easily even on their mobile phone. If you are going to use the landing for social media campaigns, then it is better to use properly optimized responsive landing pages. As most of the social media traffics are from mobile devices, using a mobile responsive landing page like Standout will help you get more leads and conversions. The footer section is made big enough to put all your important links and newsletter subscription form widget. 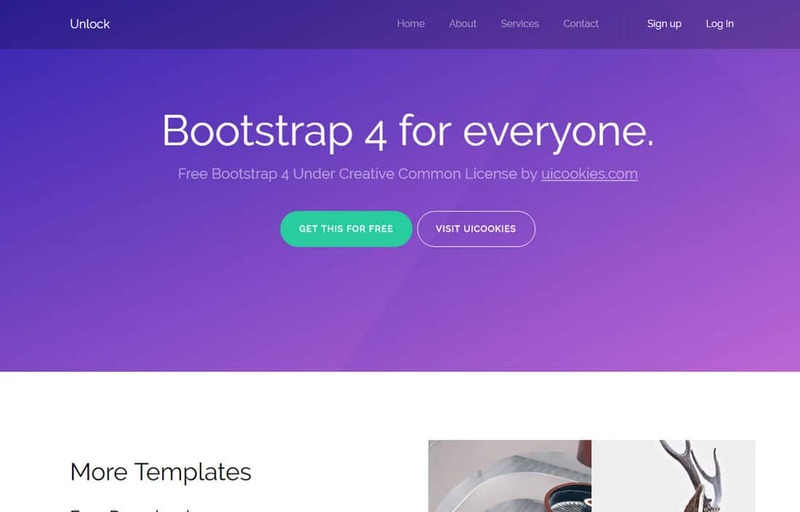 As this template uses HTML5, CSS3, and Bootstrap framework, you can easily integrate this template with other applications and platforms. Bulkapp is a landing page template for software and mobile application. From the header to the footer you have many web elements to explain the features of your application. This template includes both promotional and conversion elements to increase the conversion rate. Video contents are in the raise, adding a video about your product will have a good impact on the users. In the default design itself, you have space to add video contents. Since it is an HTML5 website template you can even add your video directly into the template. Neat pricing table allows you to list all the features in the particular plan. Web elements for showing app screenshot is also given in this template. Since it is a mobile app landing page template you have banners for Google play store and Apple app store. If you are having an active blog with valuable contents, this template gives you space to feature a few of your best articles. One of the advantages of buying a premium template you get plenty of variations and design options. With the free templates, you mostly won’t find these options, but Zeedapp is a different one. 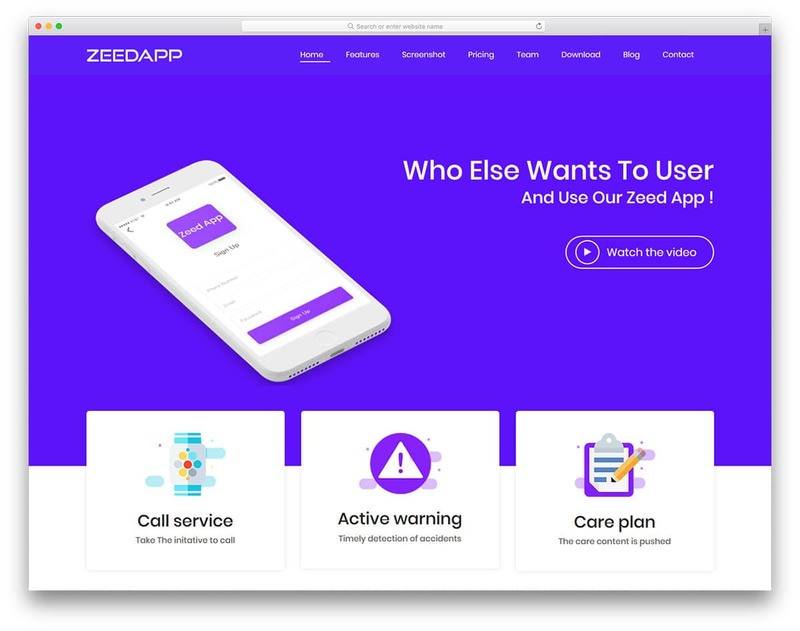 The Zeedapp template is packed with six landing page variations and for blog templates. This mobile app based landing page is the best option to narrate your application features. With modern web elements and bright colors, this template helps you to make a captivating page. Long page design with full-width layout gives you plenty of space to add your contents neatly. Smart visual effects are also combined with this template to give a lively feel. The effects are subtle, but they are used at the appropriate spots to get user attention. In the footer you have space to add contact information along with a contact form, you can use this form to collect new leads. A link for video content is given in the header itself to give a quick overview of your business. 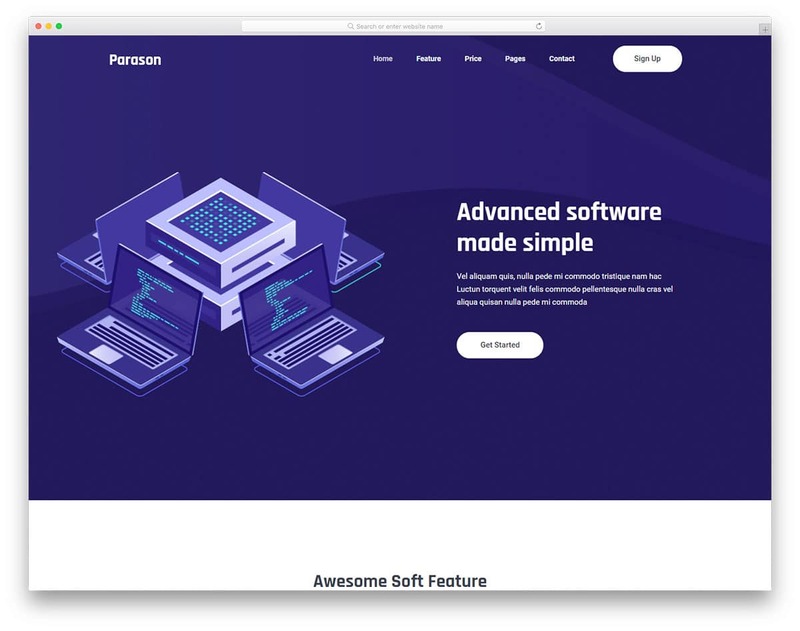 With a neat professional design, the Parson easily becomes one of the best landing page templates. Properly organized sections and bold letters help the user to easily read the contents on the landing page. Trendy fonts are used in this template to help you clearly express your content. Since we have only a few minutes to explain our product or service to the user, this bold design will clearly convey the message to the audience. Call to action buttons are placed at the most appropriate locations to direct the user to the desired pages. Ample amount of space is given for the images as well to help you present the content engagingly to the audience. 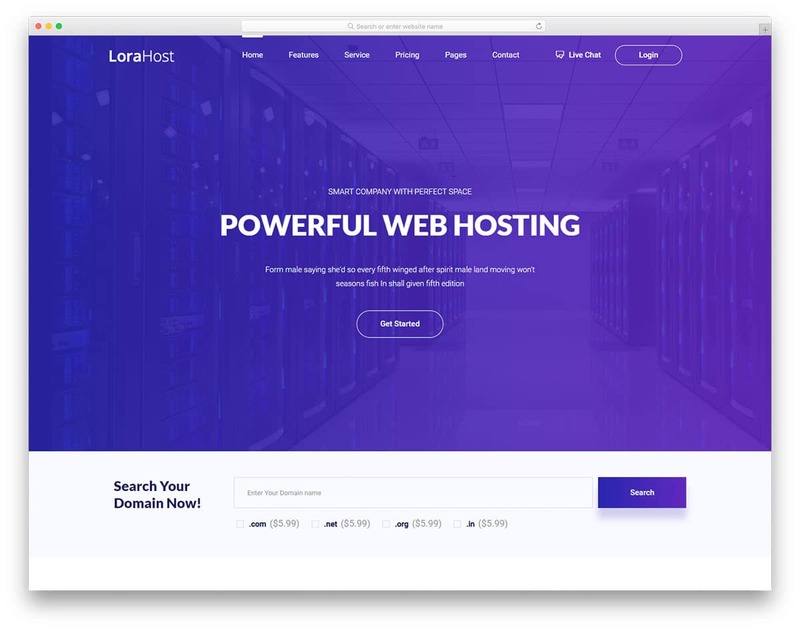 Lorahost, as the name implies this template is originally designed for hosting websites. Hosting is one of the most competitive businesses in this digital era. When you launch a new brand, your home page must be crystal clear. Without taking much of the audience time, you have to clearly explain your unique features and impress the audience. Due to this high level of precision and sensible arrangement of sections, this homepage can be used as a landing page as well. Colorful icons are used in this template to elegantly list your services. Shadow and depth effects are used smartly to highlight the important call to action buttons. By making a few adjustments to the design, you can use this template for your landing page. Iconography and illustrative designs are getting popular among modern businesses. You can easily relate to the audience and clearly explain the message to the audience. 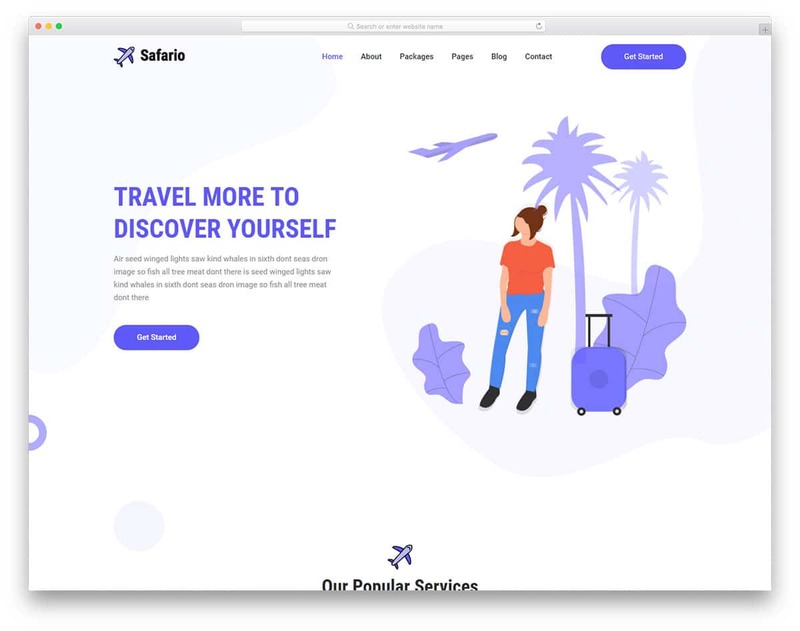 If you are planning to make an interesting landing page for travel businesses, this one is the best option for you. Since it is designed for travel agencies and other travel businesses, you get icons and images related to the travel businesses. On the clean white background, the colorful images and icons look attractive. Each section is made big enough to accommodate any web elements and contents. Forms are also given in this template to increase the conversion rate. 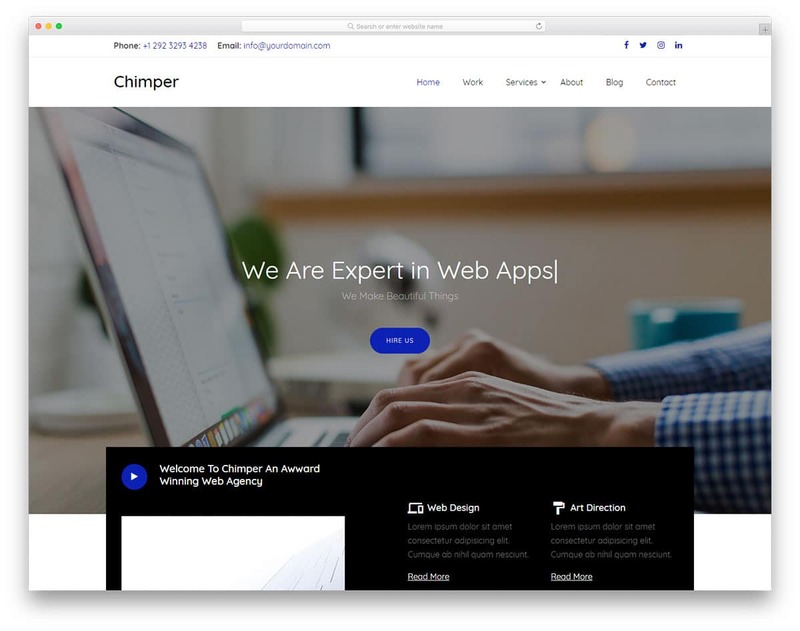 Chimper is a classy looking landing page template for businesses and startups. The creator has used modern web elements and animation effects to get user attention easily. Plus, you can clearly explain your services without taking much of the screen space. As mobile users are increasing a lot, long webpages are performing well on mobile devices. The designer has smartly handled the sections to accommodate contents and web elements in one place. As soon as the user gets into your landing page, the first thing they see is the “Hire Us” call to action button. The developer has placed the hire us button at the bottom also to increase the chances conversion. 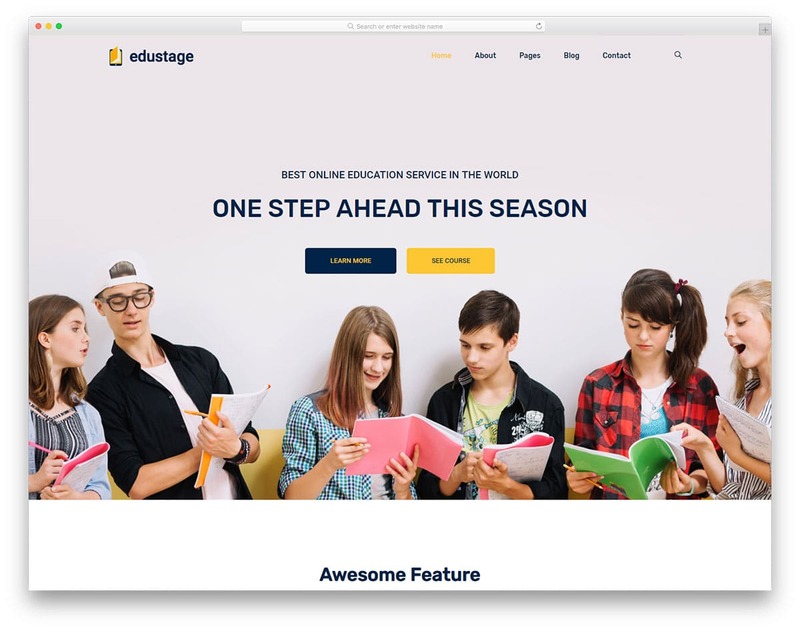 Edustage is a perfect landing page template for schools and educational institutions. If you are launching a new course or a new programme, this template will come in handy for you. In the header section itself, you have call to action buttons to explore new courses. You also have the elements to show the course rating and the number of students enrolled in a programme. A registration form is given in the homepage itself to easily access the form. This is a very professional looking template so you can’t expect creative design and animation effects. 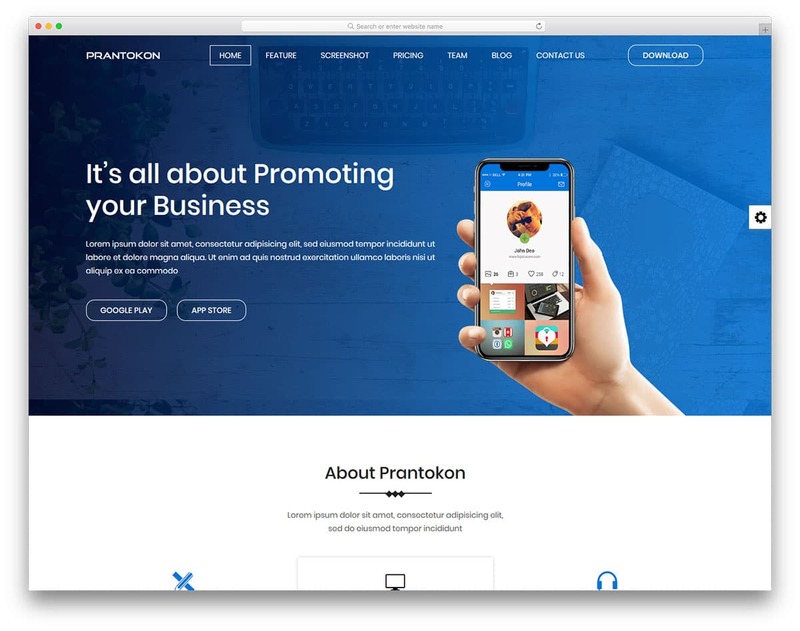 Prantokon is also a feature rich landing page template just like the Zeedapp template mentioned above. With this template, you get three landing page variation and two blog page design. Ample amount of space for both text and multimedia content is given in this template. So you can explain your product engagingly to the users. In the default demo, you have a blue color scheme, but you can customize it to your brand color. This template uses the latest CSS3 framework, so you can add any modern colors without any worries. In the top bar, you have space to add a call to action button, to increase the visibility of the button. You can use this call to action button for the main goal of your landing page. In the demo the button is used to download the application, you can set this to membership subscription or collect leads. This template even gives you the option to add video background in the header section. Overall the Prantokon is easy to use and customize website template. Web applications are now widely used in many businesses to make the workflow simple and easier. If you are also making such unique web application this SaaS landing page template is the one for you. With the simple layout and well-optimized design, this template gives a seamless performance across all devices. As nowadays mobile users are increasing, most of your social media ad campaigns will bring users from the mobile devices. Having a mobile responsive landing page will improve your result. This template is made mobile responsive and cross-browser compatible. So no matter what device and what browser your user has this template will perform better. Logical segmentation of the landing page helps the user to understand your business at a glance. As this template uses a corporate style design, you can even use this template for your business website. Startup, as the name implies this template id for creative startups. If you need a launch page for your website and collect leads before your grand opening, this template is the one for you. 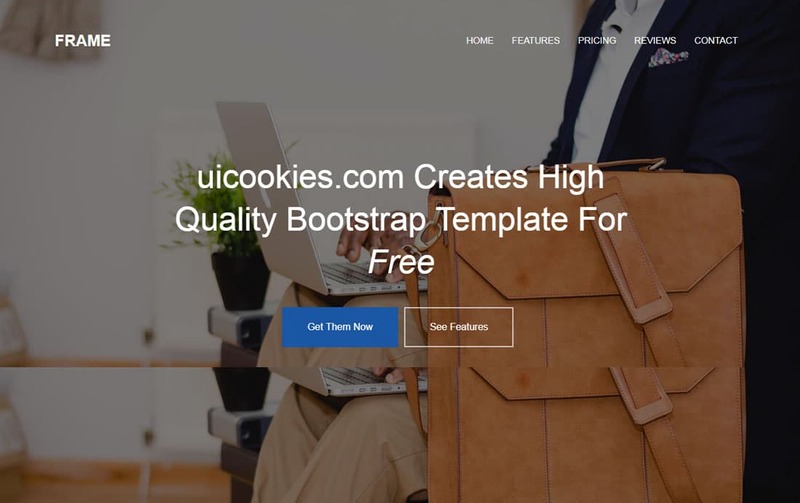 With this landing page template, you can give a clear idea of your business. The logical design of this template makes sure, what the user can expect from you. By placing the conversion elements like forms and subscription labels will help the chances of increasing your lead capturing rate. A portfolio section is given on the homepage to show some of your best works. Showcasing your previous work will help you curate the audience and help you get valuable leads. The sticky top bar with your logo not only makes navigation easier but also gives your logo a better visibility to the audience. 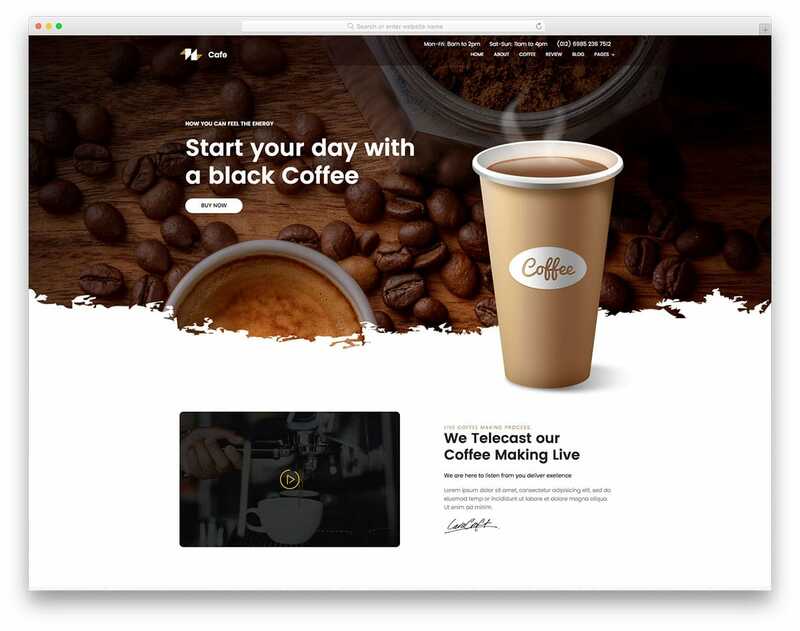 Coffee is a one-page template for restaurants and coffee shop. The precise design of this template makes it a perfect option for landing page template as well. This template is filled with creative design and web elements to make your template stand out from the usual designs. In the top bar, you have space to clearly mention your opening hours and contact details. Call to action button is placed at the header section itself to increase the click-through rate. Since this template is made for a coffee shop, a brown color scheme is followed. If you have your own color theme for your restaurant, you can use it here. Animated counters and user reviews are given to increase the credibility of your shop. Food menu section is also given in this template to help you feature some of your best foods. You can use the gallery section to showcase your foods and share some of your happy customers. 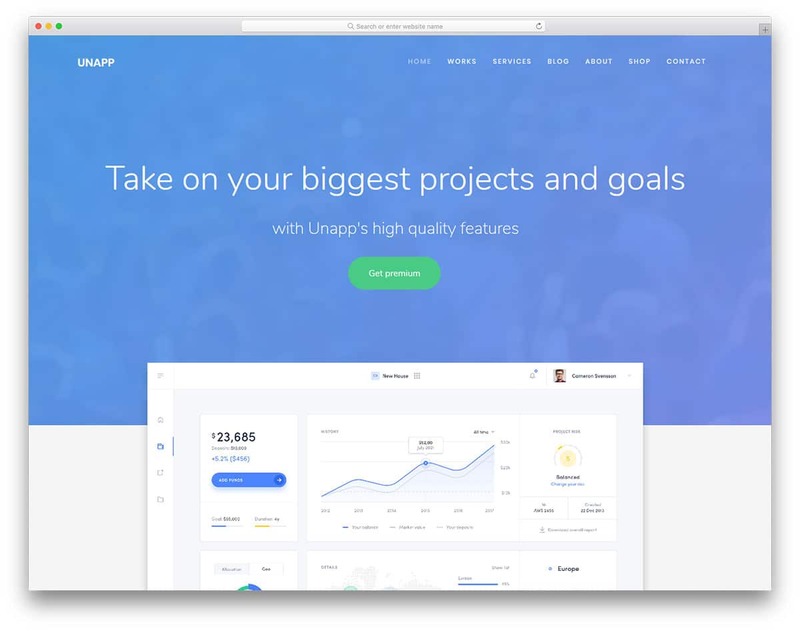 Snipp is the best landing page template for creative agencies. With cool animation effects, this template helps you to interact with your visitors engagingly. The visual effects and the animation effects in this template are smooth and fluid. This template put your work at the top and your business second. If you take pride in your work and love to impress the visitors with your work first, this template is the best option for you. 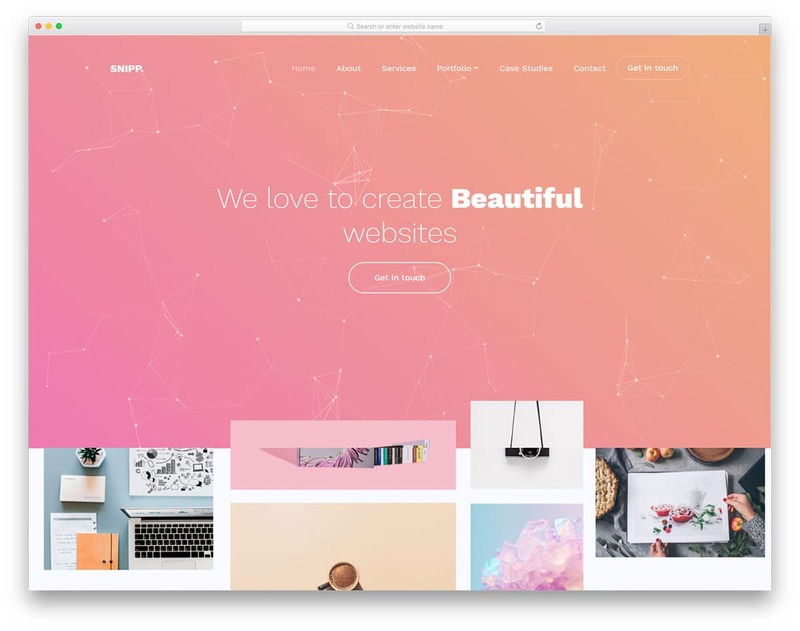 This template is filled with lots of colorful web elements and background. Other useful elements you get with this template are animated counters, particle animation background in the header and cool scroll effects. This template is primarily a website template with multiple pages pre-designed for you. But the logical homepage design of this template can be used as a landing page. 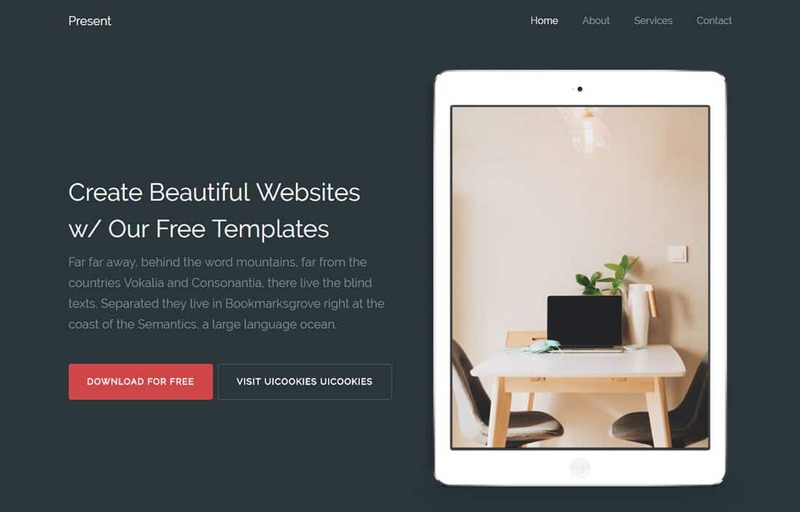 Unapp is a fully functional and fully loaded website template. The well-thought design of this template helps you to explain your product and services neatly to the users. Making the content clear to the visitor is one of the main goals of a landing page template. With the Unapp template, you can convey your content engagingly to the users. The web elements in the homepage of this template are placed at the most appropriate spots to increase your result. Since this template follows a simple design, the visual effects of this template are also made minimal. Though the effects are minimal, they can easily draw user attention. Since this template is designed for the mobile application you have plenty of elements related to SAAS websites. 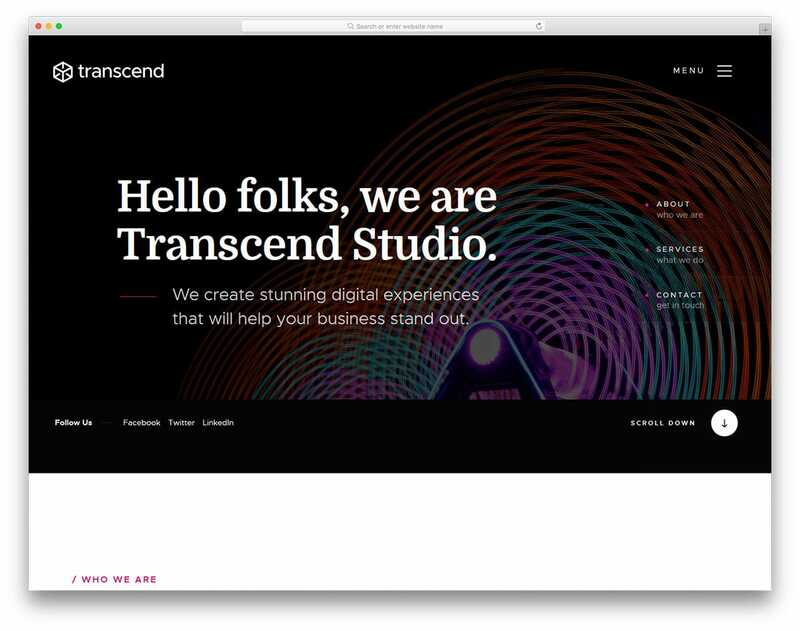 Transcend is a creative content-rich website template. Though this is a one-page website template, you can use this as a landing page template as well. The creative design of this template makes it a perfect option for creative businesses like designing agencies. Lots of space in this template is used for the text contents. Try to be more precise with your contents and be clear with your message. As said before, this template has bulletins to pinpoint the important contents. All the navigation options are hidden behind the hamburger menu if you need you can move them to the regular top bar. In the header also you have the option to put navigation menu options. Visual effects are used to show more related contents within the given space. Other useful elements you get with this template are carousels and animated counters. 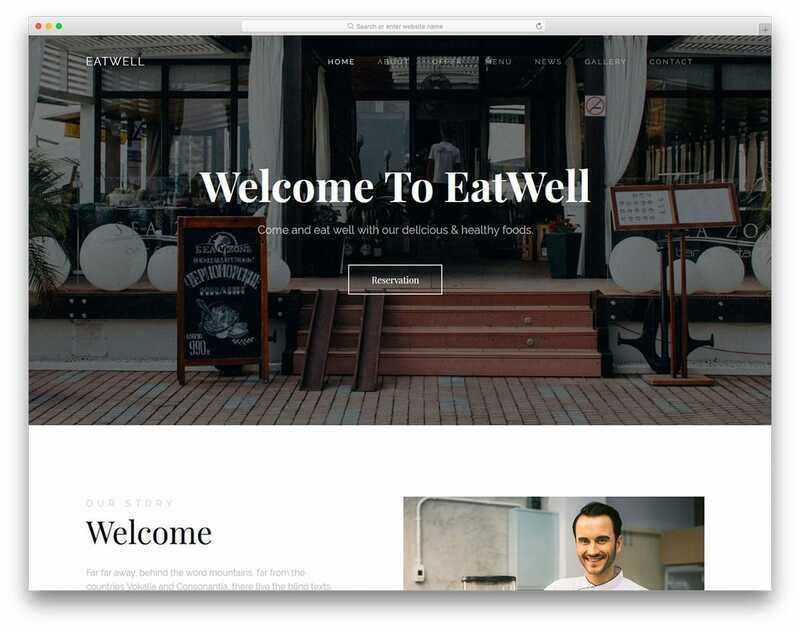 Eatwell is a minimal looking template for restaurants. With the pristine clean design, this template neatly presents the food images. Modern web elements are used to help you add more content within the given space. With the long homepage design, you can clearly show your food menu and all your services on one page. In the header itself, you have a call to action button to show that you are open for reservation. But you don’t have a dedicated reservation form in this template. You can customize the contact form for the reservation form or take a look at the registration form template collection for more creative design. In the footer, you have a map widget to show the location of your hotel so that the user can easily plan their route. If you are not a fan of the simple landing page and expect an interactive design, then Inspire is the best landing page template for you. This template is basically designed and developed for the web application based product. But the versatile design of the template can easily bend with any type of website landing page. The best part of this landing page template is, you can use it even as an HTML website template. It also has other subpages designed and developed for you in its package. In the header section, you have options to add big bold texts, subheading and a call to action button. The scroll animation gives an interactive feel to the users and also helps you to give to explain product features effectively. With this template, you get features like vertical tabs to explain features, neat line icons, carousels, and neat animation effects. Sublime, as the name implies it is a glorious and awe-inspiring landing page template. With the full-width design and clean layout, this template will mesmerize the users as soon as they land on your site. The perfect combination of colors makes this template look trendy and eye-catching. Again like Inspire you can also use this template as a website template since it has multiple subpages prebuilt for you. The visual effects of this template are clean and minimal. 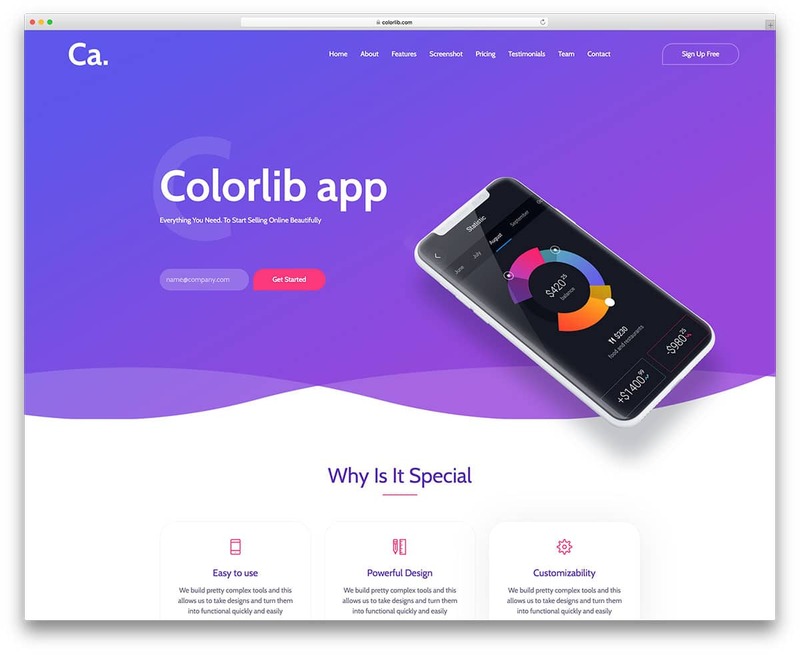 Minimal animation effects and the trendy color synergize this template to be an effective landing page. Like the Inspire this template is also primarily designed for the web application. 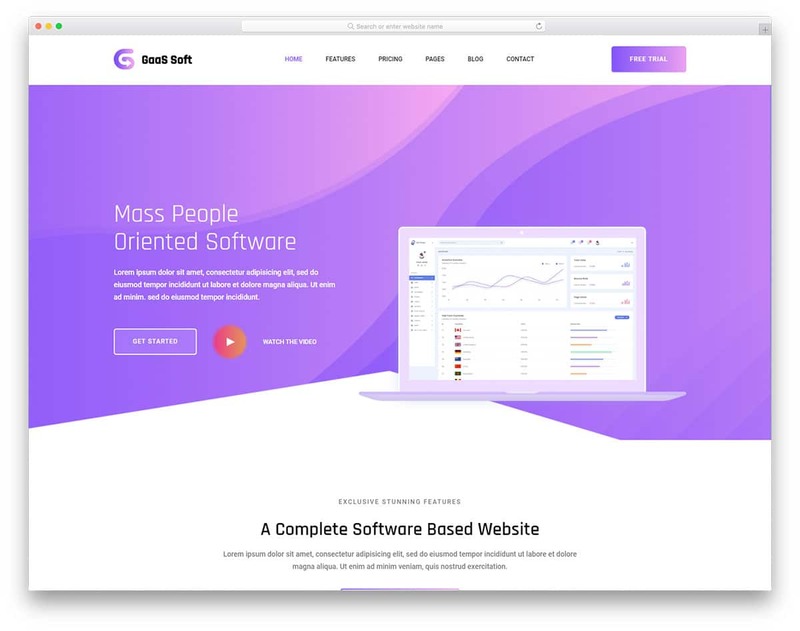 With the big footer section, you have ample amount of space to add other important links related to the product and your site. You also have the option to add social media profile links at the bottom. Unlock is more than just a landing page template. This template plays a dual role, this can be used as a simple landing page template or a product website. The design of this template can’t be included in a multistep based converting landing page. But can be included in a product tour based landing page template. The homepage of the template is neat and simple; it does not provide you many web elements on the homepage. But the homepage does provide you many options to take the users to other related pages. With this template, you get simple visual effects for the web elements and hove effects. Out of the box this template is mobile optimized, speed optimized and cross-browser compatible. 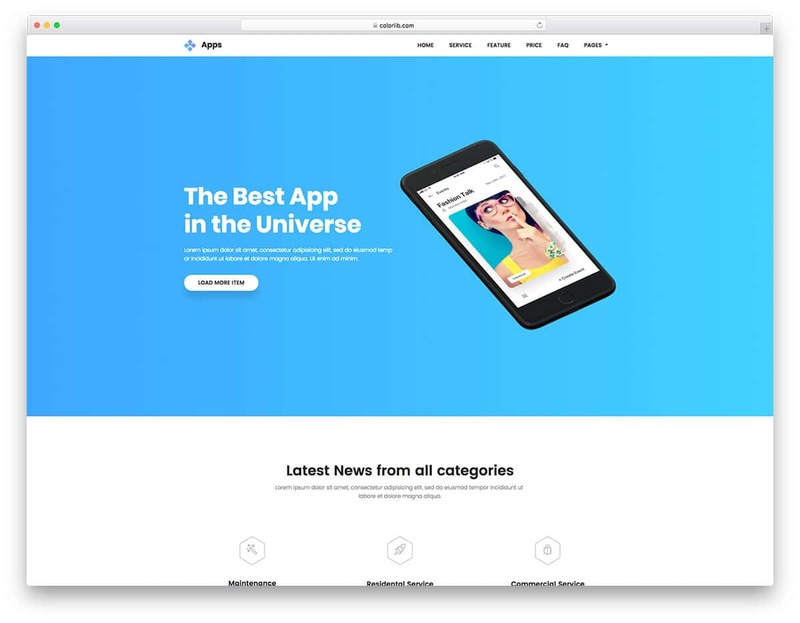 Apps is one of the truly effective free landing page templates in this list. 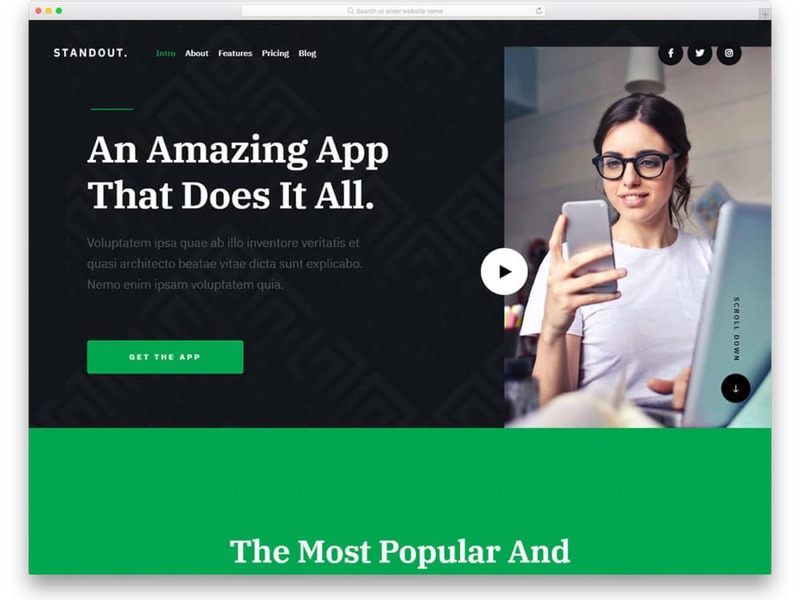 This template is built with all modern web elements to make the template apt for the today’s millennial audience, which also makes this template a future-proof landing page template. The Apps template not only follows effective landing page design, it also follows the modern web design trends. 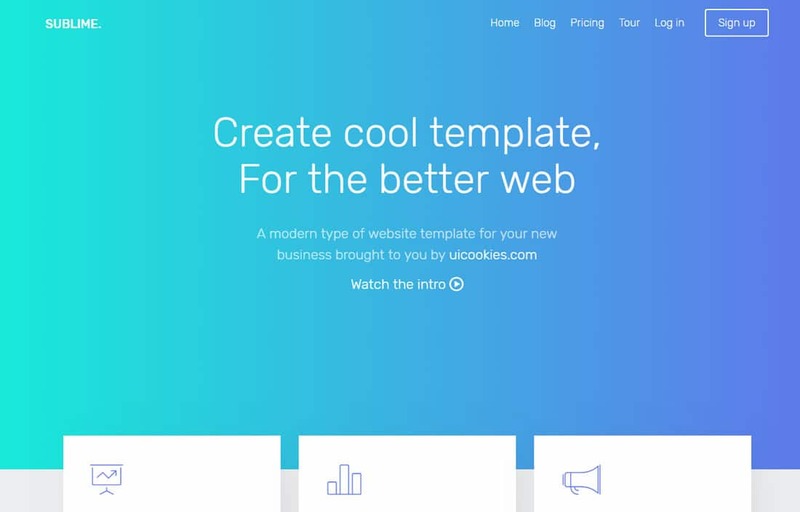 This template ticks all the boxes of modern web design. You get gradient color scheme, colorful icons, three-dimensional web elements and bold clear texts. This is a one-page template with smooth scrolling effects. Since it is a single page template the homepage is made longer to fit all web elements and sections. Each section is made big enough to handle both texts and bigger multimedia contents. Barber is another trending looking landing page template. But this landing page is for barbers. Design wise this template just follows some traits of the Apps template mentioned above, since both of the templates are from the same developers. But both of them have minor changes and uses different web elements as both of them is designed for different niches. 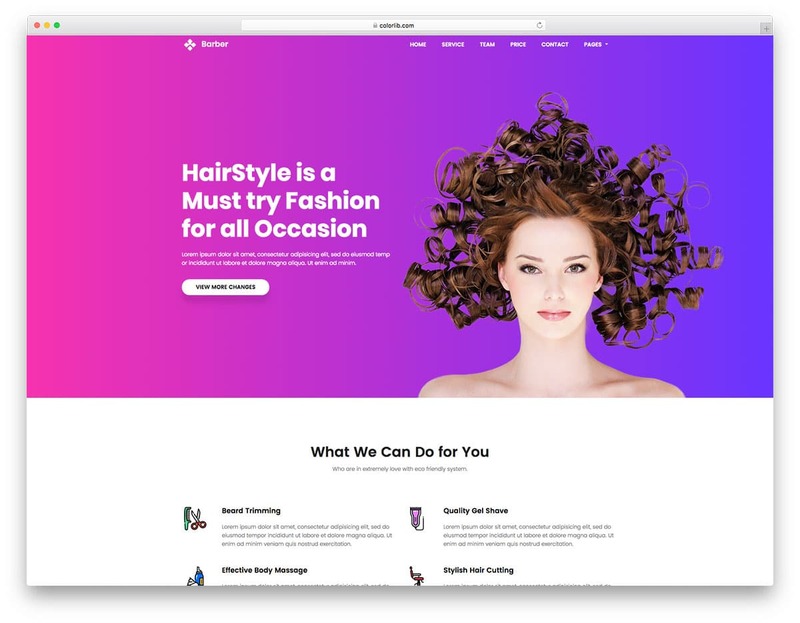 With the Barber template you get a full-width design and since this template does not follow any line or borders the web elements on this template feels like floating. In the header section, you have a big hero static image and a call to action button. The designers have used drop shadow effects to make the web elements look distinctive from the background. You also have the option to add video, the player open as a lightbox so the user can have a complete control over the video content. The Frame is a business class professional website template. By default, this template is a multipurpose template, so this can be used for various sites. The advantage of a multipurpose template is you get plenty of web elements, which may come handy as your website grow. As this template follows business class design, all the animation effects are clean and can be used for any professional sites. With the big content blocks and segments, you get plenty of space to add both the multimedia contents and text contents. The interactive scroll effects help you to narrate your services and your products effectively to the user. Since it is a one-page template the user can know all about your product by just scrolling; no switching to other pages and no loading time. The use of lightweight line icons and neat fonts makes this template even more attractive. The Present is a classy looking landing page template. With the dark skin theme, all the web elements and the texts look appealing and give a rich feel. This template also includes multiple pages, so you if you need you can use this template as a product website. Even though it is a multi-page template you get a reasonably longer homepage to help you place all the important segments. The Present template also uses a product explore design just like the Unlock template mentioned above. To maintain the design consistency the icons in this template is customized. It is a flexible website template which can be used as a landing page for any type of product. The present template uses HTML5, CSS3, and latest Bootstrap framework. 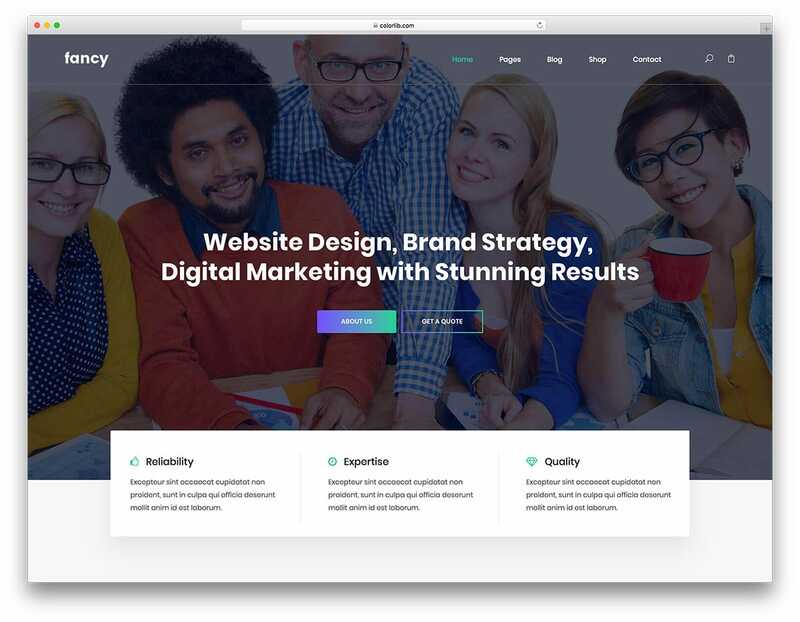 Fancy is a corporate style landing page template. The smart design of this template makes it a better fit for both the landing page and creative agency. With the full-width design and lots of white space, the web elements on this template are neatly distributed throughout the template. The parallax effects between each segment give this template a lively feel. This template uses a blue and violet color gradient as the color scheme, which looks trendy as well as professional. The best part is, even for the web elements the gradient color scheme is followed; it makes this template visually appealing. Other extra features you get with this template are animated skill bar, blog section, and carousel. CA App Laning, as the name implies this is a mobile application landing page. This trendy template uses modern design cutouts and web elements with different shapes. Since the CA App Landing is a single-page template you get a longer homepage to house all the web elements and the sections neatly. To make the navigation even better a sticky top bar navigation is used, in the navigation bar itself you have the option to add signup call to action button. This template uses two colors as its color scheme; the violet being the primary color and the pink acts as a secondary color. The combination of the color looks elegant on the clean white background of this template. Other useful features you get with this template is animated counters, carousels, and neatly designed pricing table. In the pricing table, you have the option to highlight the best package for the user. 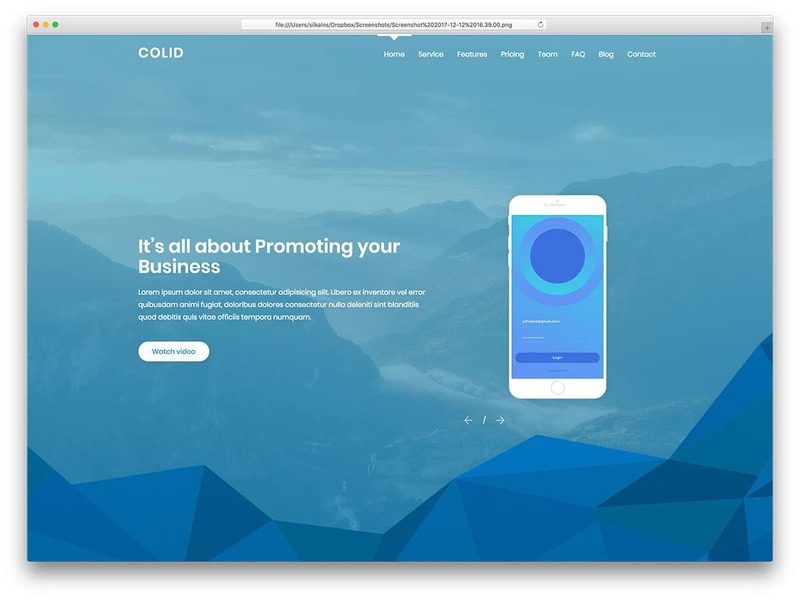 If you are looking for a stylish website template to elegantly display your product then, Colid is the template for you. This template is designed and developed solely for the mobile application, so the core features and elements you get with this template help you to promote your application. To help the user note in which section they are now, an indicator is used in the top navigation bar. The Colid template is full of visual treats and elements of surprise which will make the user raise their eyebrows. Icons used in this template is also unique and make this template stand out from the crowd. This one-page template is long enough to handle bigger content blocks and elements. Other useful features you get with this template are pricing table, carousel, accordion, and a neat contact form. 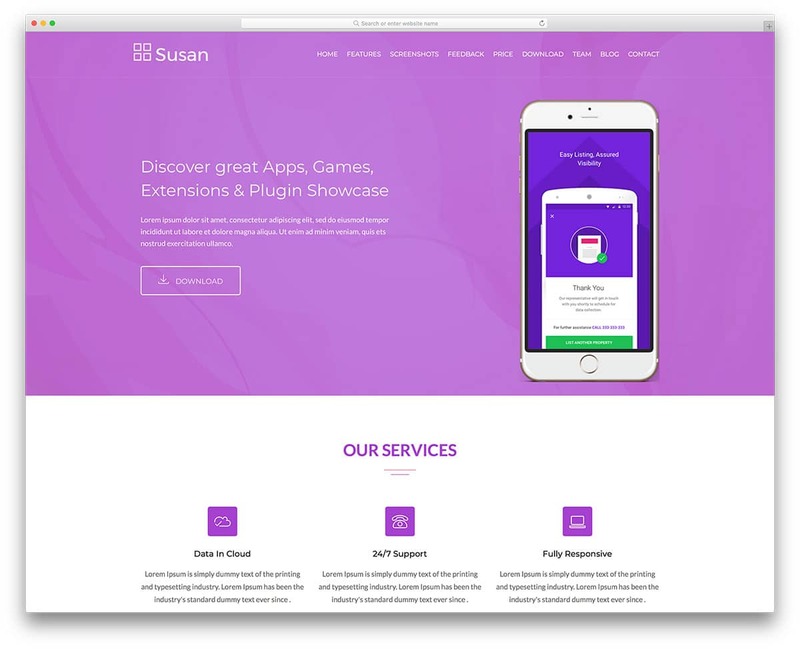 Susan is one of the few free landing page templates that gives you premium template features. With the Susan template, you get two variations, both the templates follow identical layout with different web elements and segments. Based on your need select the template that best fits you. In the header section, you have a big image slider. The image slider is designed with interactive animation effects that you get with the premium add-ons like Revolution slider. With the revolution slider you can select and customize different animation effects, but with this template, you have to settle with the effects only given in this template. 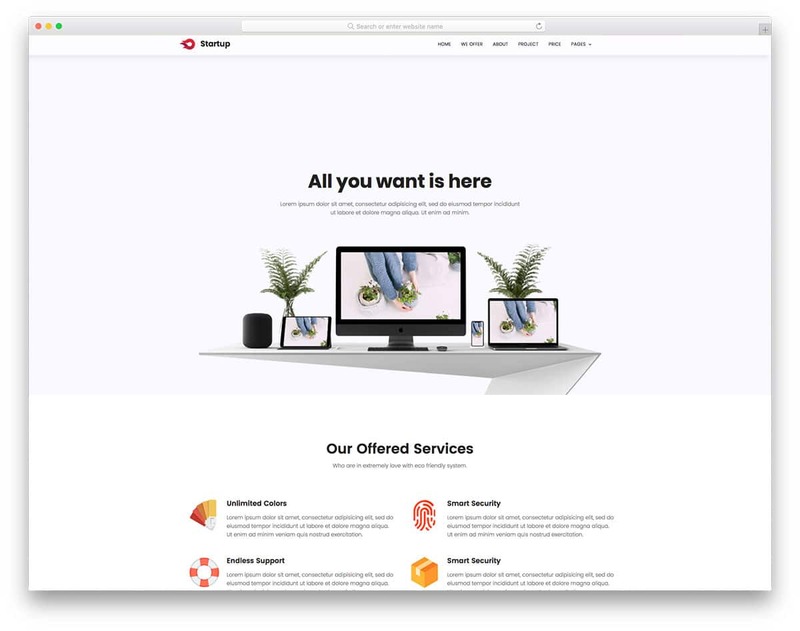 With the long homepage, you have enough space to add more features and images about your products. The hover effects and the visual effects on this template keeps the user engaged and also helps you to say more about your product within the given space. 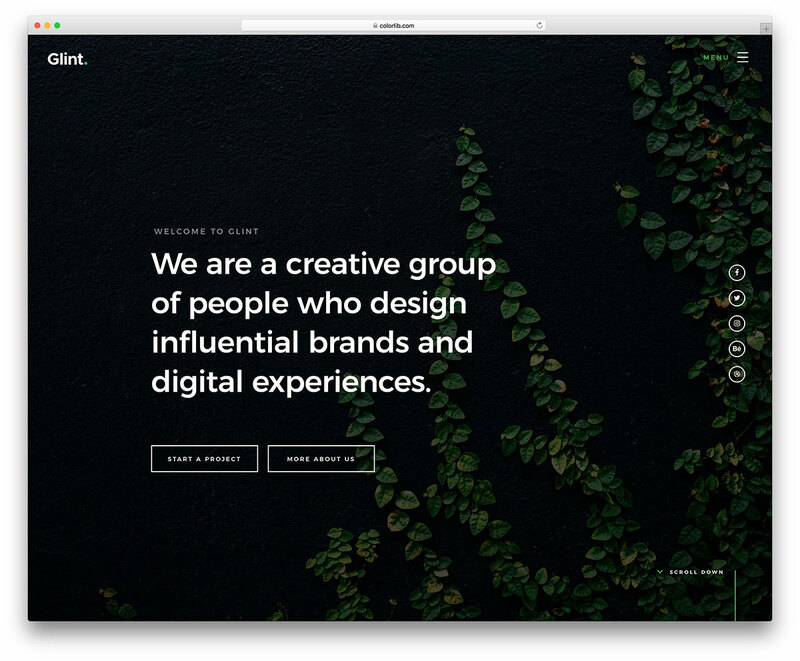 Glint is an album style website template for the creative agencies. The full page design of this template makes it a perfect fit for the landing page templates as well. When we speak of the album style design the biggest drawback is the scroll effect. The user has to scroll twice or thrice to reach the next or previous section. In the Glint template, this scroll effect feature is handled very well, the user can enjoy a smooth experience with this template. To help the user enjoy a distraction-free website experience the hamburger style hidden navigation bar is used in this template. The navigation bar is on the left side of this template, in the navigation you also have the option to include social media profile link. Overall a perfect and flexible landing page template for all types of products and services. 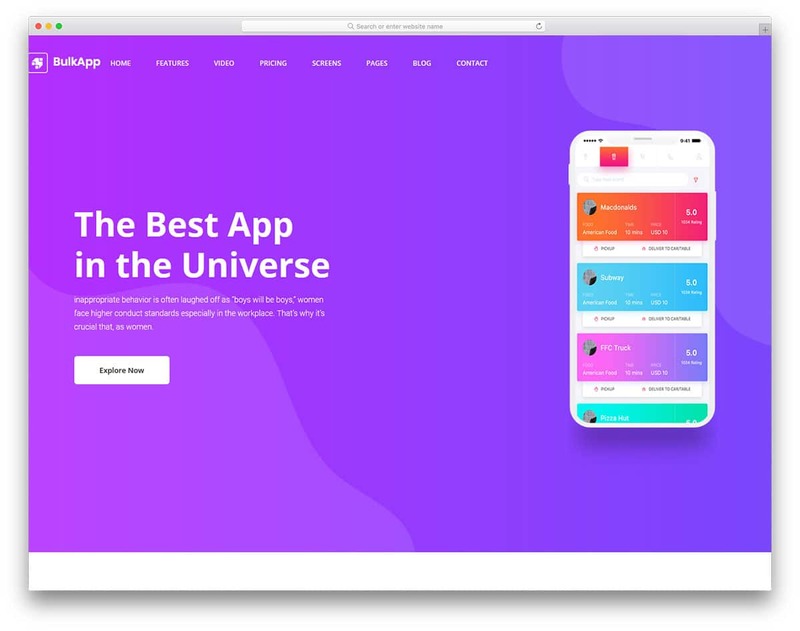 MobApp is a clean looking floating style landing page template. 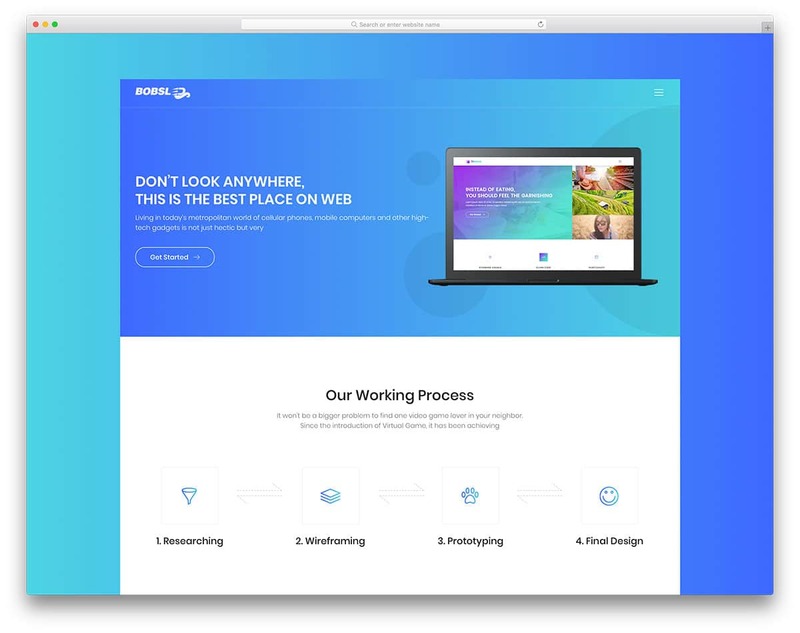 The smart design of the template and the shadow effects for the web elements make this template feel like popping out of the screen when viewed in full screen. Since this template is optimized for the mobile devices, the user will have the similar web experience even in the small screen devices as well. The use of trendy colorful icons made this template visually appealing. Since this is a one-page template to let the user know which section they are viewing a small underline is used in the sticky top navigation bar. Other useful features you get with this template are pricing table, carousels, and neat custom gradient icons. Dup is a bright colored multipurpose template. The smart design of the template makes it an easy fit for both the landing page use and website template use. This template follows a boxed width layout, but since the background color and the color scheme of the template are the similar color you don’t find any significant difference. With the bright red color as the background, the white colored boxed width contents are clearly visible and get user attention easily. With this template, you get the option to include video easily into the template. The video player opens as a lightbox so the user can enjoy the multimedia content with full control. Other useful features you get with this template is carousels, animated bars, and email subscription button. 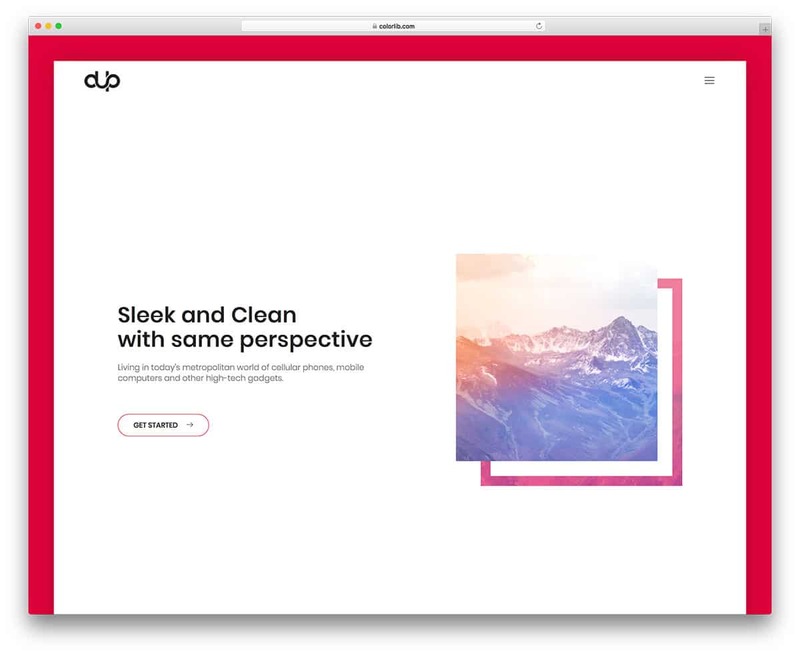 The Dup template best suits for simple landing page where you expect to share only the core feature of the product and services to the users. Bobsled is from the creator of the Dup template mentioned above. You can see some design traits of the Dup template in this also. Bobsled is a mixture of boxed-width and full-width design. The main content area is wrapped within a clean white box while the contact detail is given in an open full-width area. The trendy blue and violet color of the template gives a peppy look. Be the landing page for a product or service this template can handle both. The web elements of this template will help you illustrate your product or service in an interactive way to the user. In the footer, you have the option to include social media profile links. To give users a distraction-free website experience this template also uses hamburger style navigation menu option. Inmotion is the most refreshing landing page template in this free landing page templates list. In the header section, you have the option to add video content, you can use this place to add your product intro video. Since this template use HTML5 framework you can add video inside the template easily, or else you can add video from the Youtube and Vimeo easily. 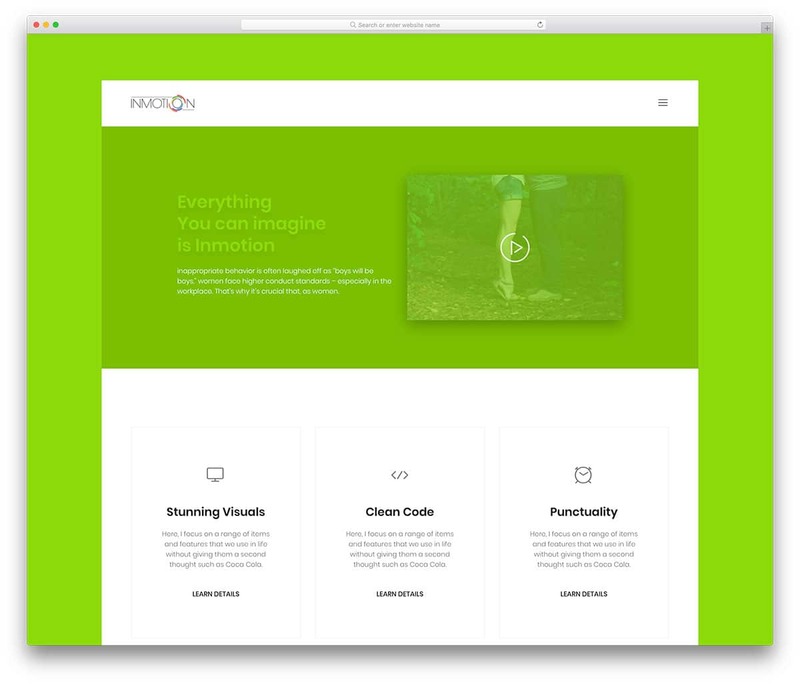 The Inmotion template helps you to create a simple landing page with which you can explain a particular product or service. The visual effects of this template manage to keep the users engaged. 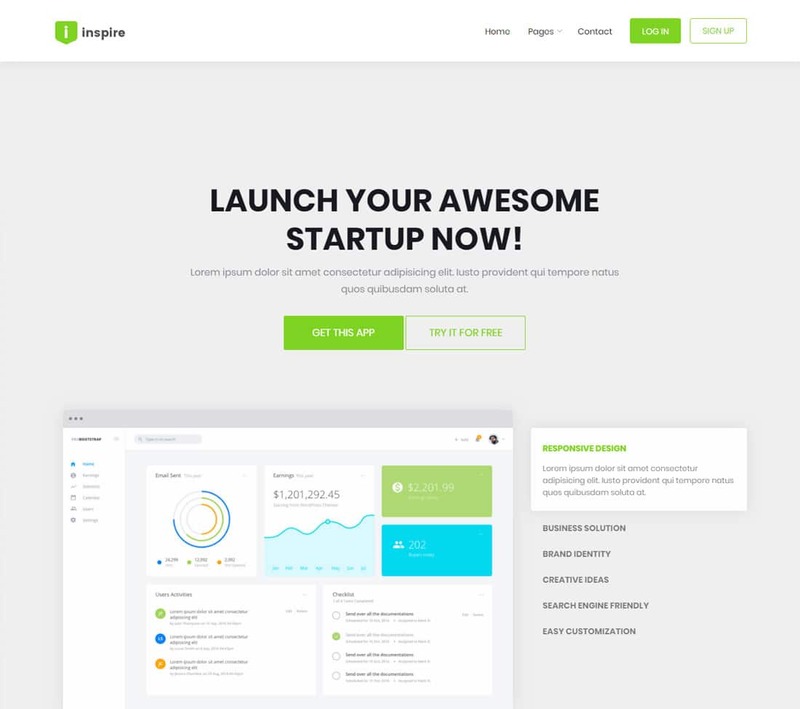 These are some of the best free landing page templates you can make use of for your site. Some of them give you premium template-like features and also follows the conversion centered design. While few them are simple and just do their job, based on your need select the best template for you.